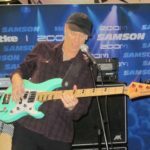 William Billy Sheehan is an American bassist known for his work with Talas, Steve Vai, David Lee Roth, Mr. Big, Niacin, and The Winery Dogs. Sheehan has won the “Best Rock Bass Player” readers’ poll from Guitar Player magazine five times for his “lead bass” playing style. Sheehan’s repertoire includes the use of chording, two-handed tapping, right-hand “three-finger picking” technique and controlled feedback.